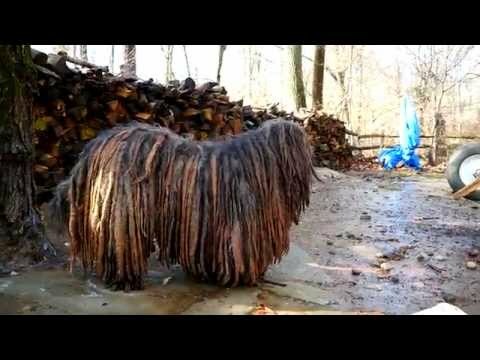 In my ongoing series of “most unusual” dog breeds, I’ve decided to take a deep dive into one of my favorite, most visually striking dogs, the dreadlocked Bergamasco Sheepdog. Did you need to re-read that word: dreadlocked? That phrase is used all of the time to describe this amazingly appealing dog. It is described by the AKC as the “shaggiest dog in the world” because of its “distinctive flocks”, it is also frequently mistaken for the Komodor. Both have distinctive coats, but while the Komodor’s coat is made of rope-like flocks, the Bergamasco Sheepdog’s are similar to dense mats that just continue to grow as the years pass. Serving as insulation against bitter cold and “armor when doing battle”, the Bergamasco Sheepdog’s coat is unforgettable. Yet, it is also a wonderful dog, in general, and ranked as one of the most intelligent, self-efficient and patient breeds. This has to do with the dog’s heritage as a sheepherding breed, which requires it to be independent and self-motivated. An incredibly devoted family dog, it is great with kids and well-suited to a wide range of households. Bergamo, the town in Italy, from which the Bergamasco Sheepdog gets its name, is in the alpine region of Lombardy and though it is not known for particularly brutal weather, the mountain conditions of the region can be difficult. Though the precise origins of today’s Bergamasco Sheepdog are not 100% clear, it is believed that they are descendants of the Briard (a French herding breed). Controversy exists, though, with many Italians insisting that it is the other way around and that the Briard has descended from the Bergamasco. There is another facet to the debate, however, since it is noted that many of the Alpine herding dogs were descendants of Middle Eastern breeds that arrived in the pre-Roman period. In fact, one expert notes that the breed can trace its origins back almost seven thousand years to what is now modern-day Iran! However the Bergamasco emerged, it is a creature that fits into its surroundings seamlessly. With a very powerful build that enables it to balance and navigate rocky slopes and steep hills, it is also covered in those flocks that enable it to come up against even the most vicious predators and enjoy the full protection of its shaggy coat. Wildly popular with herders, the dog’s numbers dwindled after World War II, and this is due in part to the war itself as well as the sharp decline in traditional herding. Dr. Maria Andreoli rescued the breed. Its history within the AKC and other formal clubs and societies is relatively recent. Though it was recorded in the Foundation Stock Service in 1997, it was not until 2007 that the AKC voted to make the Bergamasco eligible for competing in companion events as of 2008. It has been assigned the Herding Group designation, and in 2010, the Bergamasco Sheepdog Club of America became the AKC parent club for the breed. A year later, it was approved for competition in the Miscellaneous Class. In 2015, the breed was admitted to the AKC Stud Book. Though it is described as weird looking, scruffy and other unflattering things, the Bergamasco Sheepdog is actually quite an attractive dog. Its wildly unusual coat is remarkably helpful for the dog’s natural skills in herding, and underneath is a surprisingly fit and muscular dog. They have a large head and rectangular body, though it is rarely ever seen past puppyhood. Males and females are of similar size, with the average height being 22 to 24” at the shoulder. They weigh between 55 and 85 pounds and live for 12 to 15 years. Their coats grow in an array of colors with the dominant color grouping a grey to black. They can have multiple colors at once, and their coats grow into flocks or mats (or dreadlocks if you prefer) that start right along the spine and spread down to the flanks. The fur continues to grow and usually reaches the ground. The fur is made of three different textures of hair that are described as wool, goat and dog hair. They feel almost like felt and are at their fullest growth by the time a dog reaches the age of six. Their sweet faces are covered by a dense curtain of hair that protects the eyes in a few ways. It is visor-like and prevents the dogs from suffering sun blindness in snowy conditions. They also have unusually long eyelashes that hold that curtain of hair from the eyes! They sport soft and thin ears that hang down on the sides of the face, but which are set high and only about 3 inches wide at most. They do, however, have acute hearing. They often prick up the ears, but the lengthy fur prevents them from standing erect. They sport a very thick tail that hangs down and curves only slightly at the end. Natural herding animals, the Bergamasco Sheepdogs are noted for their gentleness with children. They are often described as ideal companion dogs and are especially devoted to their human families. Yet, they are remarkable “do it yourself” types that are famous for their problem-solving abilities. This all makes sense when you consider they were left with herds of domestic livestock in mountain settings where predation was a constant threat. Forced to herd and maintain the safety of the flock, they clearly had to be attentive and intelligent, but also able to create workable solutions to whatever challenges were present. In other words, this is not a breed for someone without experience in raising dogs. They are also very athletic and require plenty of exercise each day. Because of their desire and need for constant movement, they are not ideal for city dwelling, particularly if asked to live in a condominium or apartment. And as I always advise with the smarty pants breeds, it is best to get pups into obedience training and even agility training early in puppyhood. The Bergamasco may be one of the breeds who forms deep bonds with humans, and who is a great therapy dog for kids in hospital or kids with special needs, but they are always on alert. You, their humans, are their flock and so their main focus or natural goal is to protect you at all times. Thus, they need to be trained very early in their lives when they can use that protective personality and when they need to allow you (or whomever is the alpha in the household), to step in and take control. They can be quite suspicious of strangers, or even fearful of new people, places or things. So, socialization very early on is important for their health and wellbeing. And though the Bergamasco is designed to withstand the rigors of cold winters and work outdoors for most of their lives, they do not like to be kept outdoors. My readers know how anti-doghouse I am, and with this breed you must be particularly aware of their need to be inside with the family. Again, they are programmed at birth to protect their herd (i.e. you and your family). If they are locked outside and away from them, it is apt to make them miserable. A very interesting fact about their relationship with the family is that they develop unique relationships with individual people. They actually relate to each member of the household in an individualized manner. They are also described has having a psychic-like awareness of everything around them. They are often counted on to alert owners to everything from approaching visitors not yet in sight to outbreaks of violence in people or other animals. As the AKC said, “They have even been known to warn unsuspecting people that another dog was preparing to attack”. As stated, they do need exercise, and a securely fenced yard can allow them enough space to romp and burn off energy. However, long walks, active play and training in obedience and agility are ideal. If you are a hiker, this is the breed for you! If, however, you are looking for blind obedience, this is not the right breed. They are free-thinkers and bred to be self-sufficient, so adoration is not likely to be bestowed on you by the Bergamasco – though they will be insanely devoted to kids. If raised with other pets, they usually get along just fine, and they are quite accepting of new pets. Their prey drive is almost non-existent and you can trust them (once properly trained and introduced) with kids, cats, other dogs and even some smaller pets. As is the case with most male dogs, if left unneutered, there can be aggressiveness issues with other male dogs. Here is a fascinating fact about the Bergamasco’s unusual coat – it is a non-allergenic. At least for those allergic to dogs. However, people who are allergic to lanolin or wool may be sensitive to the Bergamasco’s dense coat. When wet, their flocks can have a sort of wet wool sweater smell (not wet dog, though, so that’s good!). And though it might look as if those flocks are going to demand a lot of care, they really don’t. While you can bathe the Bergamasco as much as any other dog, you cannot use any sort of soap or shampoo. This is because the coat requires those natural oils and hot baths, soaps and detergent ingredients are apt to wash them away and leave the dogs skin and coat in bad condition. Brushing can occur on a regular basis as the flocks are forming, and once a dog reaches the age of six, it is unlikely that a brush or comb will be effective. There are special brushes used to remove dirt from the flocks, however. You will also have to trim hair around the dog’s mouth area and periodically clean their face after eating to eliminate trapped foods which can cause strong odor in the fur. An active Bergamasco will need nail trimmings ever few weeks and you will need to be attentive to their ears in order to eliminate any risks of infection. A quick clean and dry every other day should suffice. And as I always encourage dog owners to practice good dental hygiene with their dogs, this advice applies to the Bergamasco Sheepdog’s as well. As I always advise, you’ll want some sort of qualifications from the breeder that the parents have been screened for the most common issues relating to the breed, particularly hip and elbow clearances. Additionally, never work with a breeder who refuses to provide health guarantees. Because the Bergamasco is still quite rare and there are no problems with overbreeding, it is a remarkably healthy breed. Smart and self-sufficient, adorable with its crazy hair and warm eyes, the Bergamasco Sheepdog is a wonderful breed. Happy with kids and other animals, and asking very little in terms of maintenance, it is an active and healthy dog that will be one of your most devoted and trusted family members. And probably one of the most eye-catching!